Contact your Life Groups, RSVP to events, manage your giving, post prayer requests to a group, update your information, find people and more. Realm is our church online community. Give the easy way – online. You can register your annual pledge, as well as make one-time gifts, or arrange for your annual or capital campaign gift to be given at regular intervals, either from a credit card or directly from your bank account. Find out how. In today’s world of cyber security, emails can be easily blocked or filtered into a bulk folder. To avoid having this happen to you, please add notifications@onrealmmail.org to your Safe Senders list. Yes. It’s a secure site supported through ACS Technologies, largest developer of church management software in the industry. ACS uses secure 128 bit encrypted transmission technology. If you log in through our website, you are equally protected. 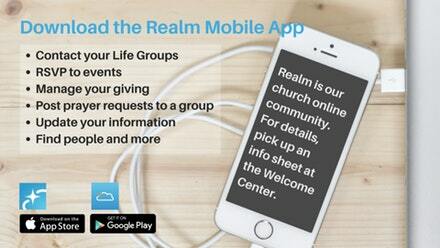 The Realm App is available to PCOL members and friends who have an account set up in Realm, our online church community. Download the Realm app called “Connect – Our Church Community” from the Google Play or iTunes App Store and login with the same account user name and password you already set up in Realm, and connect with what’s going on at PCOL anytime. Contact your Life Groups, RSVP to events, manage your giving, post prayer requests to a group, update your information, find people and more. By default, the viewing of your personal and contact information is limited to members of groups you are in, group leaders and staff members. If you choose to, however, you can make your information visible to all registered church members and friends so they can contact you by phone, email or by using your street address. Use the steps below or watch the video by clicking here. Click your name in the upper-right corner, and select My Profile. Next to Edit Profile click on the privacy icon . Select a family member (if more than one). Click one of the buttons above the line to apply that setting to all information in the profile, or click Custom Privacy and select a setting for each field. We encourage you to add pictures to help our church family and staff get know who you are. Pictures must be in a jpg format, no larger than 4 MB, appropriate for a church directory, and up close enough to clearly see your face (please no sunglasses). To add a photo, sign in, go to your profile and look for a square box next to your name. Click on the square and import your photo. Once signed in, go to the upper right and find your name. Click on the drop-down menu item called Edit My Info. Make your necessary changes. Changes are subject to staff review and may take a few business days to become active on the site. On the Realm login screen, click “Forgot your password” to have a temporary one emailed to you. Feel free to contact our Church Office by email or phone (609-896-1212). ACS Technologies Group, Inc. (“ACST”) is committed to protecting the privacy of its clients and the security of their data, especially those who access ACST sites (including without limitation acstechnologies.com, onrealm.org, onthecity.org, etc (Individually and collectively, the Sites) and corresponding services (the Sites and services are collectively referred to as the “Services”). Click here for the ACS Technologies privacy statement.